summer is one of my favorite seasons, mostly because the outdoors is filled with fabulous vivid colors – the grass is finally green, flowers are in bloom in all the colors of the rainbow, and it’s warm enough that we get to venture outside to enjoy all these beautiful things! and while my kids are usually drawn to things in their favorite colors (orange and green), they love to explore the many other colors mother nature has to offer us. growing up in a large family, my parents often had to find something to entertain us while we were in the car, waiting in line at the grocery store, or attending one of our siblings’ sporting events. “i spy” was usually the game of choice as we all enjoyed trying to outwit the others! this is a new spin on the game, however, and instead of trying to identify a specific object in a room, this game is all about finding as many things in a certain color as you can! for example, if you look in your refrigerator, how many things can you spy that are the color red? what about green? orange? blue? every time you spy one of the colors on the printable (below), color in a circle in the same color. the first color that has it’s row filled is the winner! 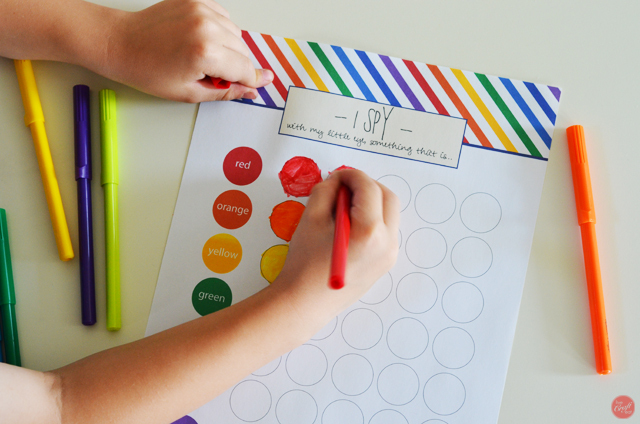 just like the original “i spy” game, this version is great to take anywhere – in the car, outside on a walk, in your house, the doctor’s office, etc. 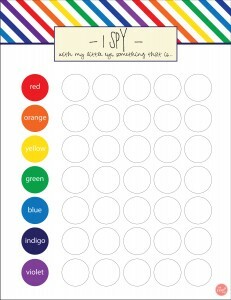 you can download the free printable “i spy” game card by clicking on the image to the left. 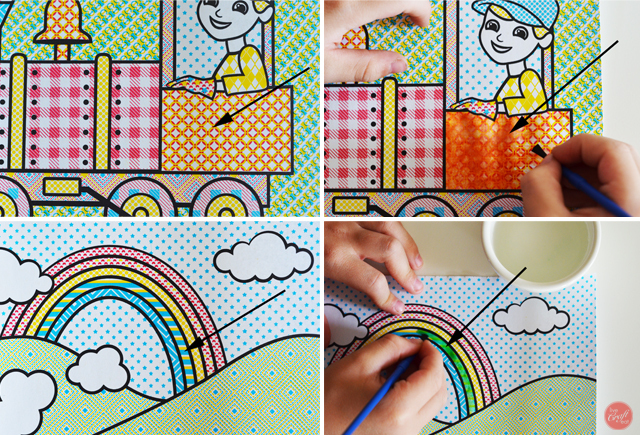 you can print off several and put them in a folder along with several colored pencils to keep in your car or in your bag so whenever the occasion arises that you need a fun game to fill the time you will have one at the ready. while matching like colors has been occupying kids for ages, we’ve tried to look around our house and outdoors to find different things that we can match. –bean bags. bean bags are easy and inexpensive to make, and we like these because we not only match the color, but the patterns as well. first, we try throwing all the blue ones, for example, in a bucket and then go a step further by sorting the blue ones by pattern. -wooden blocks. colorful wooden blocks are a staple in many homes. my kids love to build huge towers and big buildings using their blocks. but their challenge today was to build towers and buildings using only like-colored blocks. they had to get creative with the limited number of shapes available in each color and made their block-playing activity a little more challenging. -cereal and small, chewable candy. i know i’m not the only one who has ziplock bags full of cereal and treats in my purse, just in case we’re out and about when someone declares their need for something to snack on. these are great for sorting, whether at home or in the car. if at home, pour them all out on a table and sort into groups; if in the car, see if you can eat all of a certain color first and work your way through all the colors until the bag is done. -balloons. sorting balloons can be a bit tricky because they blow around the room with every movement or gust of wind from the window – but that’s also what makes sorting them so much fun! –colorful toys. colorful toys, like this stack & count parking garage are perfect for children who love to play – and learn – at the same time. while pretending that they are driving/racing/parking cars, they also learn about counting and matching the car with it’s color-coordinating parking spot. this toy has been played with countless times at my house and we especially love matching the different shades of the same color! 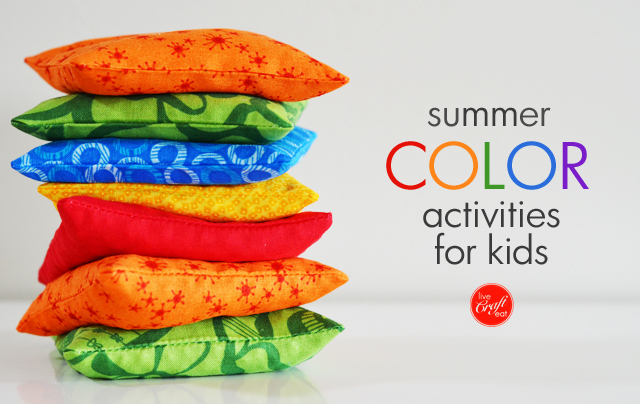 last summer i wrote a post that explained everything a child needs to know about mixing colors. it is lesson #1 in “5 Art Appreciation Lessons for Summer Learning.” learning how to mix your own paint colors does wonders for being able to create a painting just as you imagined it and allows your child the opportunity to create something uniquely his own. 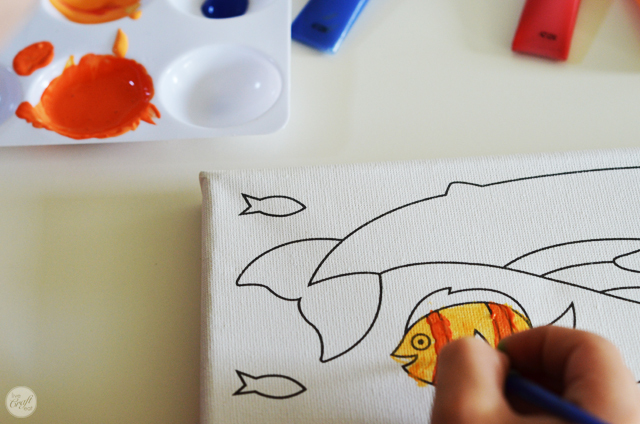 (if your child needs a bit of help thinking of what to paint, he can always use the outlines of a canvas creations picture as a starting point.) if he wants his fish to have orange stripes, what colors would he need to use to get it? even if it takes a bit of experimenting to figure it out, he will get the hang of it! activity #3 talks about painting with actual paint. but since it’s summertime and you may be outside playing in the sprinklers or pool anyway, why not pull out some paint with water art pads as a creative water activity? i love this activity because it uses the same concepts of color mixing we use with regular paint. the fun part comes when you get to think about what the colors on the shape will become once you brush on the water! if you look closely at the images below, you can see that the rectangle on the train has little bits of paint in red and yellow. do you know what color red and yellow make when mixed together? add some water and see if you’re right! yes, it makes orange! what about the stripe on the rainbow that has blue and yellow? what color do you think blue and yellow make when they’re mixed together? if you guessed green, you’re right! it’s almost like magic getting those paint patterns wet and then turning them into a completely different color! this summer is bound to be one full of happy and colorful memories. i hope we all remember to enjoy the beauty around us each and every day and encourage our children to enjoy the wonderful colors around us!